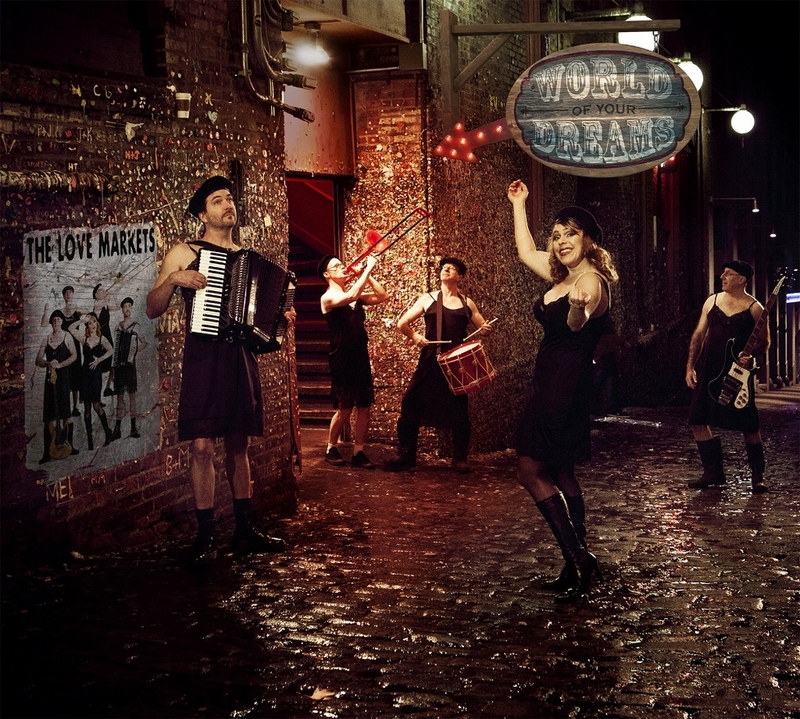 Wed Feb 27 / The Love Markets at The Triple Door! Don’t miss this fabulous night at Seattle’s swankiest music venue! Hosted by Arnaldo!, the show features a set by The Love Markets as well as music from Sweet Spot Combo and The Sirens of Swing - all kicking off March Is Cabaret Month Festival 2019. Showtime: 7:30 pm. Doors: 6:00 pm. The Triple Door, 216 Union St. BUY TIX! Sat March 30 / Angie at Egan’s for closing night of March Is Cabaret Month! Join Angie for a solo singer-songwriter set featuring new songs as she closes out the 2019 March Is Cabaret Month Festival. Also featuring a set from Maureen Mershon. Showtime: 9:00 PM. Doors: 8:30. Egan’s Ballard Jam House, 1707 Market. BUY TIX! Love Markets in Burlesco Notturno: "Unveiled"
The Love Markets and UMO at ACT Theatre Oct 5! Sat Dec 8 / 12th Annual Tom Waits Night The Love Markets join an always eclectic and thrilling lineup of musical artists playing all Tom, all night! This annual tradition is not to be missed! Conor Byrne Pub, 5140 Ballard Ave NW. Music starts at 8:30 PM. Wed May 31 / Angie at Highway 99 Blues Club with the VJ Band. Angie appears as a special guest vocalist for the night with pianist Victor Janusz, guitarist Spencer Hoveskeland, bassist Keith Lowe, and saxophonist Medearis Dixon. Showtime: 8:00 pm, 1414 Alaskan Way. BUY TIX! Wed May 24 / The Love Markets at Cafe Nordo! It's our first show at Nordo's Culinarium - come feast on Nordo's famous food and our songs of love and revolution! Showtime: 8:00 pm at Cafe Nordo, 109 S. Main St. in Pioneer Square. BUY TIX! Sat March 18 / Angie and Miz LaWanda DuPree in "Sticky and Sweet!" Miss Angie and Miz LaWanda invade March Is Cabaret Month Festival with their unholy candyland of New Orleans jazz, funk & sass. Showtime: 9:00 pm. Egan's, 1707 Market. SOLD OUT! Fri Feb 24 / The Love Markets play Jewelbox Theater! Join us for a special supper show, 7:00 pm - 8:45 pm. Enjoy great food, drinks, and songs of love and revolution from your candlelit table inside Jewelbox, a Seattle treasure since 1926. Rendezvous, 2322 2nd Ave. BUY TIX! Sat Sept 24 & Sun Sept 25 / Angie hosts STG's annual anniversary party at the Neptune with "Rocky Horror Picture Show" film, costume contest and prizes. 8:00 pm, Neptune Theatre, 1303 NE 45th. FREE! Sat June 25 / The Love Markets perform at "Bootleggers Ball", the 2016 fundraiser gala for Harrison Medical Centers. Doors at 5:30 pm, Kitsap Conference Center, Bremerton. Wed May 18 / The Love Markets play Dan Shih's Campaign Launch Party. Come find out why Dan is running to represent Seattle's 43rd district in Washington's State House of Representatives and have a good time doing it! 5:30 pm at Jensen Studios, 1424 10th Ave. $25 suggested donation. Sat May 7 / Burlesco Notturno: "POP"! The Love Markets return as musical hosts of another installment of the fabled Burlesco Notturno showcase of circus arts and burlesque. POP features Waxie Moon, The One The Only Inga, Ruby Mimosa, Retro Versa and more! Showtime: 8:00 pm at Open Space on Vashon. BUY TIX! Fri March 4 / March Is Cabaret Month Festival presents Angie Louise in "Notes From The Underground" on opening night! Showtime: 9:00 pm at Egan's Ballard Jamhouse, 1707 Market. BUY TIX! Sat December 19 / Angie's holiday concert! Singer/songwriter Angie Louise and special guests artists make merry with spice, sugar & songs of the season. Part of the Phinney Center Concert Series. Showtime: 7:30 pm. 6532 Phinney Ave North. BUY TIX! Fri December 4 / 9th Annual Tom Waits Night at Conor Byrne! Join us and a bevy of weird & wonderful bands playing all Tom, all night. Music starts at 8:30; Love Markets at 11:30. 5140 Ballard Ave NW. $10 at door. Sat November 7 / The Love Markets in "Burlesco Notturno"! Featuring Madame X, Paris Original, Jamie Von Stratton, aerialist Tanya Brno and more. Showtime: 8:00 pm. Open Space, Vashon Island. BUY TIX! Sat May 2nd / Burlesco Notturno: "HOT!" Angie and The Love Markets appear as house band in their sixth installment of Vashon's fabulous circus-burlesque arts showcase, featuring Waxie Moon, Lily Verlaine, The One The Only Inga, aerial duo Chapter 2 and more. Hosted by Madame X and her Lawyer. Showtime: 8:00 pm at Open Space on Vashon Island. BUY TIX! Fri March 27 / March Is Cabaret Month presents Angie Louise & LaWanda DuPree in "Pralines & Cream." New Orleans jazz, funk and sass with a boisterous band. Showtime: 9:00 pm at Egan's. BUY TIX! Sat March 21 / March Is Cabaret Month presents Angie Louise & LaWanda DuPree in "Pralines & Cream." New Orleans jazz, funk and sass with a boisterous band. Showtime: 9:00 pm at Egan's. BUY TIX! Sat March 14 / March Is Cabaret Month presents Angie Louise with gypsy-jazz trio Sweet Spot Combo (featuring Matthew Stull of The Bobs)! Showtime: 9:00 pm at Egan's Ballard Jamhouse. BUY TIX! Tues Feb 24 / Von Piglet Family Players at St. Clouds in Madrona with special guests Angie Louise, Alicia Healey & Jimm McIver. Music from 8 pm to 10 pm. No cover. Thurs Feb 12 / Love Markets at Jewelbox Theater! Whiskey waltzes and carnival love, all on Lincoln's birthday. Showtime: 7:30 pm. In Rendezvous, 2322 2nd Ave. BUY TIX! Sat December 6 / The Love Markets play the 8th Annual Tom Waits Night at Conor Byrne! Come celebrate Tom's birthday with a lineup of amazing musicians playing Tom's tunes. Music at 9 pm; Love Markets at 11:30. Sat December 6 / Angie and fellow Love Markets play the Lifelong AIDS Alliance Holiday Gala! Honored to entertain this organization & excited for a great party. Wed December 3 / Angie at Salty's on Alki with Victor Janusz. 6:30 - 8:30. Free! Fri October 3 / Love Markets @ JEWELBOX THEATER - Special show! Doors at 7:30, showtime 8:00. Jewelbox is located inside the Rendezvous, 2322 2nd Ave. / BUY TIX! September 19 / Angie hosts Seattle Theatre Group's annual anniversary bash at the Neptune, presenting "Rocky Horror Picture Show" with costume contest & prizes. FREE! Sun Sept 7 / Private Event / This Lake Union wedding has jugglers, stilt-walkers, 2 grooms, 3 kids, & the Love Markets! Whee! Sat July 19 / Love Markets @ Columbia City Theatre / Private Event / Epic birthday gala courtesy of Chris Snell & the folks at FRED! Wed June 25 / Love Markets at Can Can! Our big summer show at our favorite haunt. Showtime: 8:00 pm / BUY TIX RIGHT HERE! Burlesco Notturno March 25: "BUST OUT!" There's nothing like "Burlesco Notturno" at Open Space! The Love Markets and I loved sharing the stage March 25 with The Atomic Bombshells burlesque troupe, NYC's hilarious Mr. Gorgeous, and our hosts Madame X and her Lawyer. The perfect way to celebrate the green fuse that drives the flower of spring!